It’s not just serving your instant supper requirements, but the list is all about quick food at any time of the day and trust me it is completely tummy filling and a perfect respite to your hungry tummy. So are you ready for a beautiful lunch. 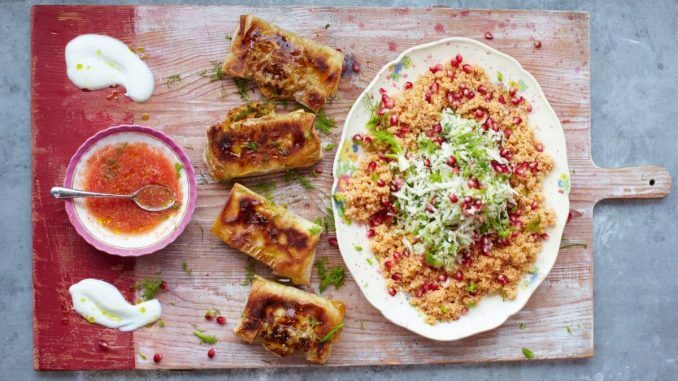 These North African-style Crab Briks are your today’s speedy lunch. Lay out a sheet of filo pastry, add ¼ of the mixture and shape into the size of a packet of playing cards at the centre of the bottom of the sheet, then push your thumb into the centre of the filling to make a space for it to expand as it cooks . Fold in the sides, then fold them up. Repeat until you have 4 briks. Put ½ a mug of couscous, 1 mug of boiling water, the tomato purée and a pinch of salt into a bowl and cover.